Urari (うらり) is a great fish marketplace that has also local vegetable stores located in Misaki Port, Kanagawa Prefecture. Misaki is one of the largest fish port for Tuna. Inside of Urari building, there are 12 stores that sales fresh fishes, especially Tuna products that you can only buy them at this market. Not only the fresh fishes, but also it has a great fish products and seafood as well. This huge market is called Urari. There many local fishers and farmers open direct stores in this place. 0. at Keikyu Misakiguchi Station. 1. use a local bus to Misakiko. Urari is the marketplace center mostly focused on the Tuna products that captured at Misaki Port which is one of the largest Tuna capturing port in Japan. 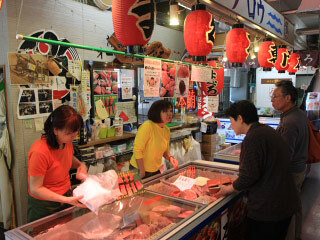 There are 12 market stores that sell the fresh seafood products and related products. It has also the food court and vegetable stores. Those tuna markets sell the unique parts of Tuna such as heads, guts and tails that never be sold at the fish market in the city. Urari also has the sightseeing cruises and many facilities help fishing.